Haier - HPB08XCM : Portable Air Conditioner Review • The Air Geeks, reviews of air conditioners, dehumidifiers and air purifiers. Can you take me Haier? Bah dum pshhh… The HPB08XCM is a low capacity air conditioner that is suitable for small offices, bedrooms, server rooms, et cetera. Apart from cooling the room, this unit removes excess moisture to ensure that your room has a truly comfortable environment. This unit comes with an easy to install window venting kit. Furthermore, it has a compact profile. It measures 27.5 x 12.9 x 13.8 inches and weighs 40.3 pounds. In case you are looking for a low capacity air conditioner for your small room, then you need to consider this unit. If you have already identified this unit and you are searching for reliable information about its performance, then you are in the right place. We have compiled all the information that you need about the HPB08XCM. This information will answer all your questions regarding this portable unit. The HPB08XCM is a portable air cooling unit that offers a capacity of 8000 BTU. This air conditioner is suitable for relatively small rooms. According to Haier, this unit is suitable for rooms that are not larger than 250 square feet. Are you struggling to control high temperatures and excess moisture? If your answer is yes, then this air conditioner could be the right solution for you. It offers a dehumidifier’s mode that removes excess moisture to ensure that your room has the desired relative humidity. Its inbuilt dehumidifier lowers the moisture level to create an environment that is undesirable for the growth of mold and mildew. The HPB08XCM employs a single hose design and offers three fan settings, three cooling settings, dehumidifier mode, and a 24-hour on/off timer. Whereas the fan and cooling settings allow you to adjust the air conditioner depending on your cooling needs, the on/off timer allows you to preset the unit. The unit can therefore start or go off without requiring your attention. Are you looking for an air conditioner that you can move from one room to another with ease and convenience? This single hose unit features castor wheels that allow you to push it from one position to another. Unless when you want to take it upstairs or downstairs, you don’t need to lift it. Furthermore, the HPB08XCM comes with an easy to install window venting kit. This kit fits in virtually all horizontally and vertically sliding windows. Emptying the reservoir from time to time can be a tedious task especially if the relative humidity in the surroundings is high. 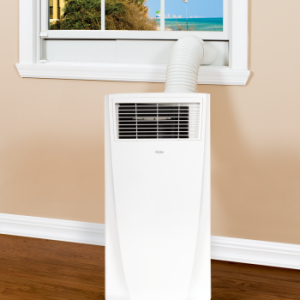 This air conditioner utilizes an advanced auto evaporation technology to minimize the accumulation of the condensate. In case you are looking for an air conditioner that will free you from draining the condensate manually, then the HPB08XCM is a suitable solution for your air cooling needs. Furthermore, this system has minimum maintenance needs. This is a good point, because seriously, who wants to maintain a portable AC unit all day? Offers auto evaporative mechanism. This highly effective mechanism makes manual draining unnecessary. Easy to install and has minimum maintenance needs. You can install this air conditioner in less than ten minutes. Furthermore, it has minimum maintenance needs. Effective cooling and dehumidification. When correctly installed in a small space, this unit cools the room quickly and effectively. Single hose design. Most dual hose systems are faster and more effective than single hose air conditioners. Auto-evaporative mechanism less effective in high humidity environments. The technology becomes less reliable when the levels of humidity in the surrounding are very high. If you are looking for a light air cooling system for your small room, then the HPB08XCM is a suitable option. This low capacity unit has a single hose design and employs auto evaporative technology to minimize manual draining. This budget-friendly unit costs $ 300 and has lower (not haier – bah dum pshhh) power needs as compared to most air conditioner of same capacity. In case you are looking for an air conditioner for a medium or large room, then this unit is not a suitable solution for your cooling needs. Furthermore, if you are looking for a system that is based on a dual hose design, the HPB08XCM has a different design. If none of these drawbacks is a big concern for you, then you can proceed and buy this unit for your small bedroom, server room, office, et cetera.